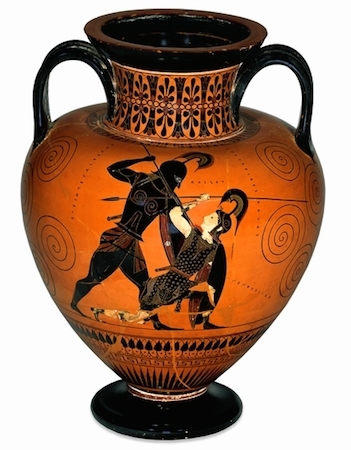 Achilles killing the Amazon Queen Penthesilea, 540-530 B.C.E., black-figured amphora (wine-jar), signed by Exekias as potter and attributed to him as painter, 46 cm tall, Athens, Greece © Trustees of the British Museum. Penthesilea brought her Amazon warriors to help the Trojans defend their city, but was killed in combat with Achilles, the greatest of the Greek warriors. The ancient Greeks lived in many lands around the Mediterranean Sea, from Turkey to the south of France. They had close contacts with other peoples such as the Egyptians, Syrians and Persians.The Greeks lived in separate city-states, but shared the same language and religious beliefs. During the Bronze Age (around 3200 – 1100 B.C.E. ), a number of cultures flourished on the islands of the Cyclades, in Crete and on the Greek mainland. They were mainly farmers, but trade across the sea, particularly in raw materials such as obsidian (volcanic glass) and metals, was growing. 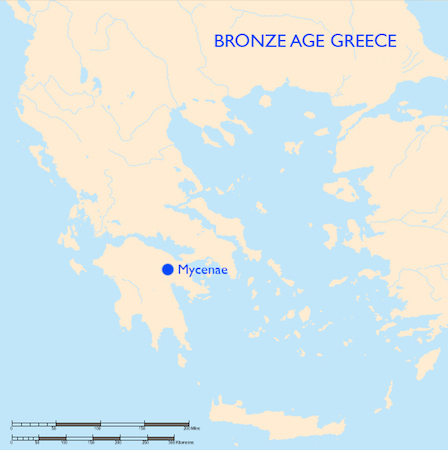 Mycenaean culture flourished on the Greek mainland in the Late Bronze Age, from about 1600 to 1100 B.C.E. The name comes from the site of Mycenae, where the culture was first recognized after the excavations in 1876 of Heinrich Schliemann. Pottery stemmed bowl decorated with a procession of riders in chariots, Mycenaean, about 1400-1300 B.C.E., 42 cm high, Cyprus, Greece © Trustees of the British Museum. The upper zone of the vase is painted with a frieze of chariots, pulled by elongated horses, in which ride a charioteer and a passenger. Such chariot processions on vases may well have been inspired by contemporary fresco-paintings which decorated the walls of Mycenaean palaces. The Mycenaean period of the later Greek Bronze Age was viewed by the Greeks as the “age of heroes” and perhaps provides the historical background to many of the stories told in later Greek mythology, including Homer’s epics. Objects and artworks from this time are found throughout mainland Greece and the Greek islands. 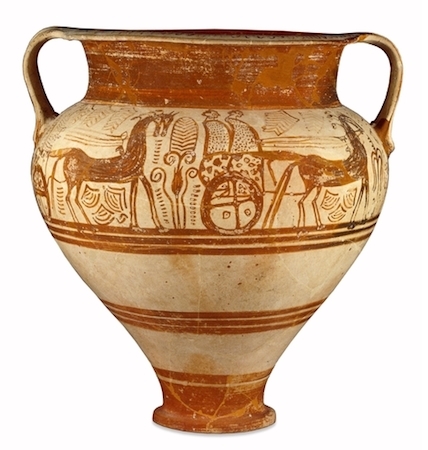 Distinctive Mycenaean pottery was distributed widely across the eastern Mediterranean. These show the beginnings of Greek mythology being used to decorate works of art. They come from about the same time that the epics of Homer were reaching the form in which we inherit them, as the earliest Greek literature. The collapse of Mycenaean civilization around 1100 B.C.E. brought about a period of isolation known as the Dark Age. But by around 800 B.C.E. the revival had begun as trade with the wider world increased, arts, crafts and writing re-emerged and city-states (poleis) developed. Two of the most distinctive forms of free-standing sculpture to emerge during the Archaic period of Greek art (about 600-480 B.C.E.) were statues of youths (kouroi) and maidens (korai). Kouros (the singular form) is a term used to describe a type of statue of a male figure produced in marble during the Archaic period of Greek art. Such statues can be colossal (that is larger than life) or less than life size. They all have a conventional pose, where the head and body can be divided equally by a central line, and the legs are parted with the weight placed equally front and back. The male figures, usually in the form of naked young men, acted both as grave markers and as votive offerings, the latter perhaps intended to be representations of the dedicator. The female figures served similar functions, but differed from their male counterparts in that they were elaborately draped. The mouth is invariably fixed in a smile, which is probably a symbolic expression of the arete (“excellence”) of the person represented. It used to be thought that all kouroi were representations of the god Apollo. However, although some may be representations of gods or heroes, many were simply grave markers. The kouros was not intended as a realistic portrait of the deceased, but an idealized representation of values and virtues to which the dead laid claim: youthful beauty, athleticism, and aristocratic bearing, among others. By around 500 B.C.E. “rule by the people,” or democracy, had emerged in the city of Athens. Following the defeat of a Persian invasion in 480-479 B.C.E., mainland Greece and Athens in particular entered into a golden age. In drama and philosophy, literature, art and architecture, Athens was second to none. The city’s empire stretched from the western Mediterranean to the Black Sea, creating enormous wealth. This paid for one of the biggest public building projects ever seen in Greece, which included the Parthenon. Ancient Greece also played a vital role in the early history of coinage. As well as making some of the world’s earliest coins, the ancient Greeks were the first to use them extensively in trade. 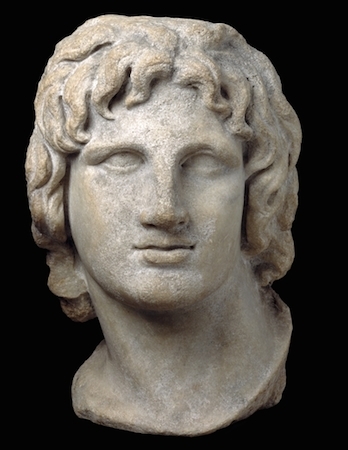 Following the death of Alexander and the division of his empire, the Hellenistic period (323-31 B.C.E.) saw Greek power and culture extended across the Middle East and as far as the Indus Valley. When Rome absorbed the Greek world into its vast empire, Greek ideas, art and culture greatly influenced the Romans. Alexander was always shown clean-shaven, which was an innovation: all previous portraits of Greek statesmen or rulers had beards. This royal fashion lasted for almost five hundred years and almost all of the Hellenistic kings and Roman emperors until Hadrian were portrayed beardless. The British Museum collection includes objects from across the entire Greek world, ranging in date from the beginning of pre-history to early Christianity in the Byzantine era. Cite this page as: The British Museum, "Ancient Greece, an introduction," in Smarthistory, February 28, 2017, accessed April 22, 2019, https://smarthistory.org/ancient-greece-an-introduction/.